Lightly coat salmon with olive oil and season with salt and pepper. Press chopped basil onto each fillet. Heat a large sauté pan over high heat; coat the bottom with remaining olive oil. Place salmon in pan and brown each side. Transfer fish to a baking sheet and place in oven. Bake salmon about 6-10 minutes, depending on the thickness of the fish. Remove from the oven. Serve with couscous and garnish with balsamic syrup. Heat a large sauce pan over medium-high heat; add olive oil. Stir in onion; saute for 2 minutes. Stir in garlic and red pepper flakes; continue cooking for about 5 minutes, until onions are translucent and lightly browned. Add tomatoes, water, and capers. Reduce heat to a simmer; cook for about 1 hour until the sauce begins to thicken. Stir in olives and fresh herbs, and season to taste with salt and pepper. While sauce is simmering cook couscous according the instructions on the package. Toss with extra virgin olive oil and the puttanesca sauce. Whisk the ingredients together and put in a non-aluminum saucepan. Bring to a boil over high heat and then reduce heat to simmer the liquid. Reduce the liquid by ½ and take off the heat to cool. 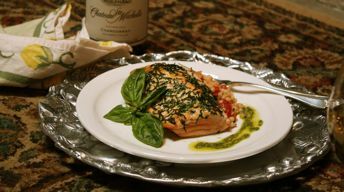 Use to drizzle over the salmon before serving. This will hold at room temperature for over a month.